The Executive Summer School uses a “learning by doing” methodology that offers you the opportunity to identify, explore, and overcome management challenges in an incessantly-changing business environment. 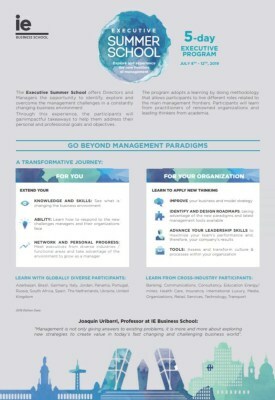 In this unique experience, you will explore roles related to management frontiers and the five essential areas of management with leading academics and renowned professionals guiding you along the way. VISION: A clear view of the changes defining today’s business landscape and a complete understanding of management frontiers as a response to these transformations. ABILITIES: The capacity for identifying challenges and responding to fundamental managerial transformations on both a personal and professional level. TOOLS: An assessment of the relevance and implications related to managerial transformations within each organization, along with a range of specific tools for reacting in every area of management. PERSONAL DEVELOPMENT AND NETWORKING OPPORTUNITIES: First-hand experience in roles required for responding to today’s managerial challenges. FOR YOUR ORGANIZATION: The mindset and tools for rethinking and improving your business model and strategy; the organizational capability to identify and build responses, taking advantage of the new paradigms; and assessing and honing leadership skills to maximize your team’s performance and create an impact within your company. In this video, Norman Kurtis, Academic Director of the IE Executive Summer School, discusses the four main factors that make this program an essential experience for visionary management professionals. If you have chi ldren over the age of 16, why not sign them up to the IEU Youth Leadership Summer Program or Summer School for Young Professionals, and receive a 10% concession of the program fee. At IE, we want to encourage you to take the next step in your career. For this reason, we offer you the chance to access the program’s Early Registration Process. Students enrolled before May 8th 2019 will receive a scholarship with 5% off the full tuition cost.